Each month, we sit down with a Designetics innovator to talk about his or her career, what makes fluid applications systems at Designetics special, and topics relevant to the fluid applications industry. 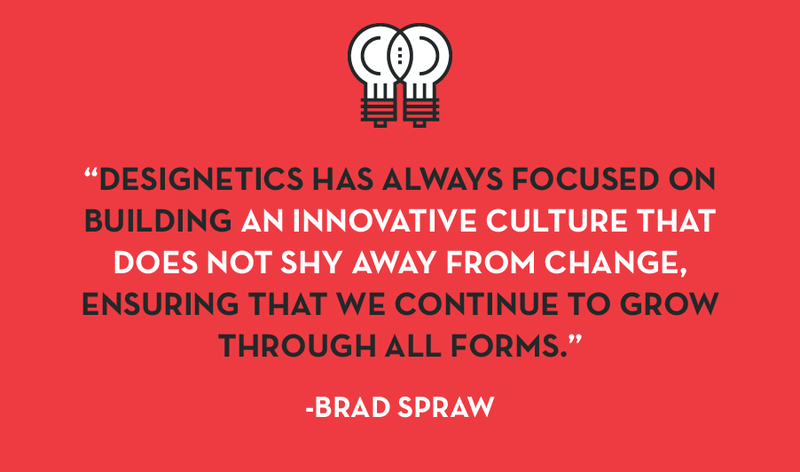 This month: Director of Sales Brad Spraw. A: Nearly 15 years ago, I was fortunate to have a brief internship supporting New Product Development and Market Research. During this time, I was able to begin to understand the Designetics way of manufacturing. Soon after, while completing my MBA, there was a need for a part-time position cutting felt. This position allowed me to understand the manufacturing process, and sparked a great interest in learning more about Designetics, Inc.
Q:How has Designetics changed since you first started at the company? A: I can remember the first time walking into the new building—our current facility. It seemed MASSIVE. While it was empty, we said multiple times, “we are never going to fill this space.” That was short-lived, with multiple upgrades to our machining area, molding area, equipment building, and the most important part, our advancements in manufacturing Designetics fluid applicators. Q: How do you approach the sales process with new clients? A: Our process is a very hands-on, technical process. It is my goal to know as much about (our client’s) process that I can. My experience has allowed me to understand multiple processes where I can provide my recommendations for best practices for processes. And, my goal is to take the stress of fluid application off the customer…and onto my shoulders. We regularly visit the customers’ facility to see the process, receive samples of their substrate, work with the chemical manufacturers and complete the internal testing, including video and photos for documentation of our process capability. Q: Does your approach differ between new and existing clients? How? A: The approach between existing and new clients differs greatly. The difference is due to the history we have with existing clients and their confidence in Designetics and our products. When working with a new client, there is a bit of educating, demonstration and proving out our process competence. Q: What are some of the things a salesperson has to focus on in a consultative sale? A: Literally everything. One thing we teach in the training of our sales personnel is to look at the entire picture. As I have mentioned, we truly are a solutions provider. I can instill more confidence in our client by gathering the entire frame of the process and point out the pros and cons of their current production methods. We focus primarily on the fluid application onto the substrate, but through our experience, we are able to offer recommendations on the best practices. Listening is important—whether it is for a manual or automated process. We have a wonderful support system at Designetics and this information is always passed down the chain and into final production for the receipt of our client. Q: Can you outline how a client is onboarded to Designetics from first contact call, through the closing of a sale and beyond? A: We begin by discussing the fluid that they are applying along with their substrate. We work with them to decide if a manual or automated process is best for them, based on their annual volumes, cycle times, piece throughput and overall needs of the client. If we are able to pull an existing applicator from our selection of over 5,000 different applicators, we will send it to the client for initial testing. However, at times we must design new applicators for the customer. We are very innovative, and we take pride in our ability to rapid prototype through R&D investments in new technology, such as 3D printing and proprietary rapid tool making. The testing process with the customer is a hands-on approach with new clients, and existing clients typically report back on the approval of the applicator. Our QMS follows the ISO 9001:2015 manufacturing process, ensuring that our made-to-order system provides repeatable products that our clients expect and deserve. We rely on the future communications with our clients to extend their success in their manufacturing process and allowing us to provide our expertise to them. Q: Are there ways technology can be used to help and accelerate the sales process? A: We have great pride in producing results for our customers in rapid turn-around time. We understand that our clients are under pressure and expect us to return with results. 3D printing, and equipment investment in new machinery in our Tool & Die department add to reducing the response time and providing real solutions to the client’s processes. Q: Where do you see Designetics going in the future? A: Designetics has always focused on building an innovative culture that does not shy away from change, ensuring that we continue to grow through all forms of the manufacturing process, including the sales department. The management of this company welcomes new ideas, alternative processes and ways to “peel a banana.” Investing in the employees of Designetics R&D and learning from our clients will continue to drive the future. Designetics will focus on being a solutions provider first, allowing our reputation as the world’s leading fluid application specialist to flourish.